With the new test release of Instagram shoppable photo tags, now is the time to ensure your account is killin’ it and ready to attract customers. And even if you’re not worried about that — the numbers alone give you good reason to nail that ish dowwn. There’s over 700 million monthly active users* on Instagram. YUP. Which is why you can’t really say “my customer isn’t on Instagram” unless your customer is an 86yr old man like my grandpa who has never even sent an email. Then FINE. But everyone else, they’re on there. We just gotta find them. So let’s make sure you’re ready with a really strong foundation with my best Instagram tips for business. This post may contain affiliate links, which means I may earn a small commission if you make a purchase. I only recommend products I love + trust; and appreciate your support of The Shop Files! There’s a method to building up a sustainable social media account and starting off with a strong foundation is the quickest path to success. Many times we’re so ready to “GROW GROW GROW” that we forget we need to build something people would want to follow and be a part of. So just in case, let’s go over some Instagram beginner tips. The first step to Instagram success is to create a feed that people want to scroll through and are instantly attracted to. This is like making sure your house is clean + picked up before having company over. Remove the clutter, spruce up your decor, and help your guests flow in your space. If you skip this step it doesn’t matter how stiff the cocktails are (okay, maybe it helps), the first impression won’t make them want to return again. There are 6 ways to creating a beautiful, well put together Instagram feed and getting this right is really your first step. If your feed looks janky or unattractive to your core customer, no amount of hashtags or ‘growth hacks’ will make your followers stick around. The second step is actually getting people to show up. How can you invite people onto your feed day in and day out without actively going out and finding them (because ain’t nobody got time for that)? Simple answer: targeted hashtags for your business. In this article, I share my 3 pronged approach (say that 3 times fast) to finding the best hashtags for your business. It’s not enough to throw up the “popular ones” and watch the likes roll in. You’re not in the business of likes… you’re in the business of selling your products to make money. If you want to jump start your hashtags, check out the Hashtag Discovery Workbook. It shares the exact research steps I take with clients to find their ideal audience on Instagram, what to look for in picking your hashtags, and how to actually work with the new algorithm to make it work in your favor. Now that your feed is pretty and you’re starting to attract your customer… make sure they stick around and engage with your brand! Much like O’Doyle rules, engagement rules on Instagram. No need to make this overly complicated either, there’s just two simple steps to follow. Why do Instagram comments even matter so much? Well, first of all they’re key indicators to the Instagram algorithm that your post is GOOD and more people should see it. They’re like little baby boosters for your posts! They also help to build stronger customer relationships as you get to talking and actually interacting with your end user. And if your comment game is real strong – they promote your post organically through Instagram’s own way of “sharing” content with others. Okay. How are we feeling? Hopefully confident because next we’re going to tackle some common Instagram mistakes… if you’re making them, DO NOT PANIC. There are easy fixes to each. This article reviews 13 common mistakes businesses make on Instagram. Use it as a checklist and work through each – I share fixes for each “mistake” so you can take action today. Most take just a few minutes to fix or adjust for future posts! Plus, you can already check #1 off your list because you already tackled it in #2 above. YAY. Look at you. Eight easy options to make your images stand out, most are even under $10! Plus, go totally hands free with my favorite phone holder (I think it’s better than a traditional tripod). Background ideas #4 and #6 are my favorites. If I was allowed to drape our entire home in this rug, I would. No question. Scheduling social media is a no brainer. 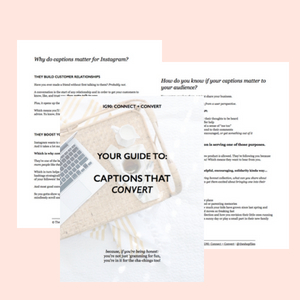 You’ll write better captions that connect, stress less, and finally nail that whole “be consistent” thing. vacation – we all need those, right? The best benefit of all? TIME to actually be social + interact with your followers! Since you’re an Instagram master now, let’s take away the manual scheduling and set you up with an Instagram scheduling tool (fo’ free). Check out my recommended tools here. Your foundation is set. Your images are looking fooiiiine as hell and you’re scheduling weeks out in advance like a pro. No more ‘link in bio’ changes again. Yep, never change your Instagram link in bio again. Plus, if a customer sees an older post from a few days ago and wants to shop that specific item? She can! This tool will take her to the exact product page so she can just add to cart + checkout! This is super important as Instagram users are twice as likely to be on mobile versus desktop – and you all know how annoying it is to hunt around a website on your phone. Over a third of Instagram users have used their mobile to make a purchase, so this tool makes it a win-win. Video is on the rise. There’s no way around it, and that’s good news for businesses that get behind the video marketing trend. YouTube reports mobile video consumption rises 100% every year. Every year! Should I continue? Or do you just want to learn how to use Instagram Stories for your business? So what is it about you ask? Well, you’ll have to read on. Hint: “Turn on Post Notifications” is the not the answer. Double hint: It’s not about beating it. Don’t listen to those fear-mongers. You can actually work with it and let it BENEFIT you. The algorithm’s only goal is to serve content that matters to each individual because Instagram wants everyone to love hopping on and seeing everything they care about or discovering some new accounts they love. A lot of people make the algorithm sound real shady, like it’s out to get us; but it’s actually a good thing. Because it means if YOU’RE the account who someone regularly interacts with – they’ll ALWAYS see your posts! How do we get more of our followers to engage with us? Check out 10 ways to re-engage and work with the Instagram algorithm. Ohh snap, you know I love a good bonus (or six)… so let’s keep going! The first one is honestly my favorite AND it double counts as the start of smart networking (but like, in the most introvert friendly way). Try one of these 5 strategies to increase your Instagram reach. Get inspired with some new ideas and accounts… I’d bet there’s at least 5 you haven’t tried before that could be a game-changer for your feed. Get inspired with 18 Instagram photo ideas! …see what it is here! Boom. 4 reasons why you should plan in advance. The first one is so, so important for all these other pieces to come together. Even if you’re not a numbers nerd like myself, you’ll find at least 2 nuggets of useful information. Review, adjust and grow your Instagram with these simple analytics. Let’s talk about what it is, how to know if you’re affected, and how to fix + avoid it. Which of these Instagram tips for business was your favorite? Let me know below + get started on improving your account today! PSST> Pin this for later! If you want to learn more about Instagram hashtags or need guidance on the research process, check out my new ebook the Hashtag Discovery Workbook. Each business and customer base is unique so while I can’t give a set of hashtags to use, I can walk you step by step through my hashtag strategy, how to maximize your exposure by getting into the Top 9 Posts section, and other tips + tricks on making hashtags work for your business. Want new customers to find you, like today?! Uh, yes! Grab the Hashtag Discovery Workbook – learn more here! If you’d rather not DIY the whole thing, give your work to me! I do custom hashtag packages and would love to help your business get the exposure it deserves. Discover your brand's Instagram theme! Find your Feed with this free, 3-day email challenge. Yasss! Let's start laying your Instagram foundation so you can connect with + converts your audience! Check your email to grab your cheat sheet! Yes, I want a cohesive feed! This is such an amazing compilation of articles. Glad I found it. Thank you! I literally just went through and read this entire post and all of the links and wasn’t planning on it but it was so helpful that I couldn’t stop! Amazing, I’m your new favorite fan! AH thanks Tiffany!! I love hearing that… what was your favorite thing to learn or try? Join over 7,000 subscribers + receive actionable marketing tips you can implement - today! WANT A FULL MONTH OF INSTAGRAM CAPTION IDEAS? Yahh of course you do!